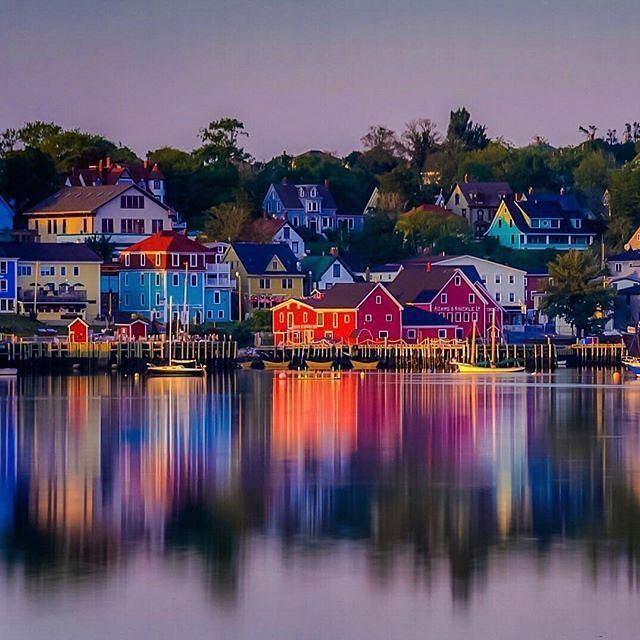 Nova Scotia (; Latin for "New Scotland"; French: Nouvelle-Écosse; Scottish Gaelic: Alba Nuadh) is one of Canada's three Maritime provinces, and one of the four provinces which form Atlantic Canada. Its provincial capital is Halifax. 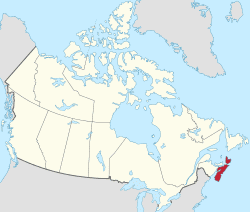 Nova Scotia is Canada's second-smallest province, with an area of 55,284 square kilometres (21,300 sq mi), including Cape Breton and another 3,800 coastal islands. As of 2016, the population was 923,598. Nova Scotia is the second most-densely populated province in Canada with 17.4 inhabitants per square kilometre (45/sq mi). 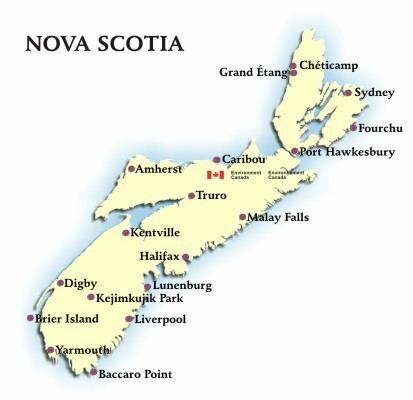 "Nova Scotia" means "New Scotland" in Latin (although "Scotia" was originally a Roman name for Ireland) and is the recognized English language name for the province. In Scottish Gaelic, the province is called Alba Nuadh, which also simply means "New Scotland". The province was first named in the 1621 Royal Charter granting the right to settle lands including modern Nova Scotia, Cape Breton Island, Prince Edward Island, New Brunswick and the Gaspé Peninsula to Sir William Alexander in 1632. Nova Scotia has many ancient fossil-bearing rock formations. These formations are particularly rich on the Bay of Fundy's shores. Blue Beach near Hantsport, Joggins Fossil Cliffs, on the Bay of Fundy's shores, has yielded an abundance of Carboniferous age fossils. Wasson's Bluff, near the town of Parrsboro, has yielded both Triassic and Jurassic age fossils. Nova Scotia lies in the mid-temperate zone. Since the province is almost surrounded by the sea, the climate is closer to maritime than to continental climate. The winter and summer temperature extremes of the continental climate are moderated by the ocean. However, winters are still cold enough to be classified as continental – still being nearer the freezing point than inland areas to the west. The Nova Scotia climate is in many ways similar to the central Baltic Sea coast in Northern Europe, only wetter and snowier. This is in spite of Nova Scotia being some fifteen parallels south. Areas not on the Atlantic coast experience warmer summers more typical of inland areas, and winter lows a little colder. The British conquest of Acadia took place in 1710. The Treaty of Utrecht in 1713 formally recognized this and returned Cape Breton Island (Île Royale) to the French. Present-day New Brunswick then still formed a part of the French colony of Acadia. The British changed the name of the capital from Port Royal to Annapolis Royal. 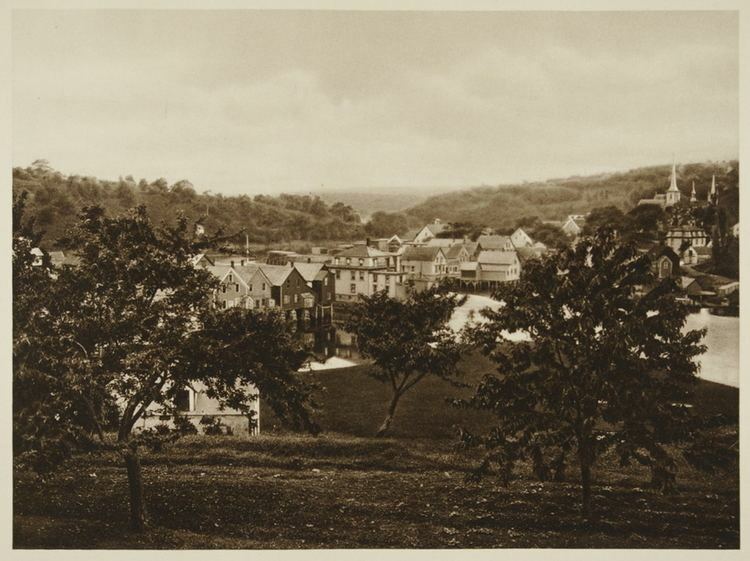 In 1749, the capital of Nova Scotia moved from Annapolis Royal to the newly established Halifax. In 1755 the vast majority of the French population (the Acadians) were forcibly removed in the Expulsion of the Acadians; New England Planters arrived between 1759 and 1768 to replace them. The warfare on Nova Scotian soil during the 17th and 18th centuries significantly influenced the history of Nova Scotia. 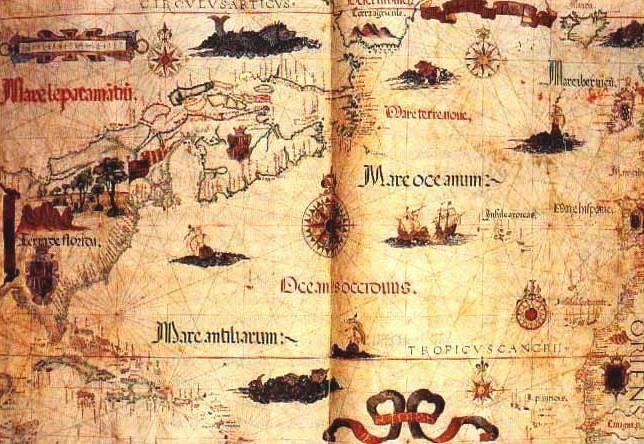 The Mi'kmaq had lived in Nova Scotia for centuries. The French arrived in 1604, and Catholic Mi'kmaq and Acadians formed the majority of the population of the colony for the next 150 years. During the first 80 years the French and Acadians lived in Nova Scotia, nine significant military clashes took place as the English and Scottish (later British), Dutch and French fought for possession of the area. These encounters happened at Port Royal, Saint John, Cap de Sable (present-day Port La Tour, Nova Scotia), Jemseg (1674 and 1758) and Baleine (1629). The Acadian Civil War took place from 1640 to 1645. The Mi'kmaq signed a series of peace and friendship treaties with Great Britain, beginning after Father Rale's War (1725). In 1725, the British signed a treaty (or "agreement") with the Mi'kmaq, but the authorities have often disputed its definition of the rights of the Mi'kmaq to hunt and fish on their lands. A generation later, Father Le Loutre's War began when Edward Cornwallis arrived to establish Halifax with 13 transports on June 21, 1749. A General Court, made up of the governor and the Council, was the highest court in the colony at the time. Jonathan Belcher was sworn in as chief justice of the Nova Scotia Supreme Court on October 21, 1754. The first legislative assembly in Halifax, under the Governorship of Charles Lawrence, met on October 2, 1758. During the French and Indian War of 1754–63 (the North American theatre of the Seven Years' War of 1756-1763), the British deported the Acadians and recruited New England Planters to resettle the colony. The 75-year period of war ended with the Burial of the Hatchet Ceremony between the British and the Mi'kmaq (1761). After the war, some Acadians were allowed to return and the British made treaties with the Mi’kmaq. The American Revolution (1775–1783) had a significant impact on shaping Nova Scotia. Initially, Nova Scotia – "the 14th American Colony" as some called it – displayed ambivalence over whether the colony should join the more southern colonies in their defiance of Britain, and rebellion flared at the Battle of Fort Cumberland (1776) and at the Siege of Saint John (1777). Throughout the war, American privateers devastated the maritime economy by capturing ships and looting almost every community outside of Halifax. These American raids alienated many sympathetic or neutral Nova Scotians into supporting the British. By the end of the war Nova Scotia had outfitted a number of privateers to attack American shipping. British military forces based at Halifax succeeded in preventing American support for rebels in Nova Scotia and deterred any invasion of Nova Scotia. However the British navy failed to establish naval supremacy. While the British captured many American privateers in battles such as the Naval battle off Halifax (1782), many more continued attacks on shipping and settlements until the final months of the war. The Royal Navy struggled to maintain British supply lines, defending convoys from American and French attacks as in the fiercely fought convoy battle, the Naval battle off Cape Breton (1781). After the Thirteen Colonies and their French allies forced the British forces to surrender (1781), approximately 33,000 Tories or Loyalists (the King's Loyal Americans, allowed to place "United Empire Loyalist" after their names) settled in Nova Scotia (14,000 of them in what became New Brunswick) on lands granted by the Crown as some compensation for their losses. (The British administration divided Nova Scotia and carved out the present-day province of New Brunswick in 1784). The Loyalist exodus created new communities across Nova Scotia, including Shelburne, which briefly became one of the larger British settlements in North America, and infused Nova Scotia with additional capital and skills. However the migration also caused political tensions between Loyalist leaders and the leaders of the existing New England Planters settlement. The Loyalist influx also pushed Nova Scotia's Mi'kmaq People to the margins as Loyalist land grants encroached on ill-defined native lands. As part of the Loyalist migration, about 3,000 Black Loyalists arrived; they founded the largest free Black settlement in North America at Birchtown, near Shelburne. However unfair treatment and harsh conditions caused about one-third of the Black Loyalists to resettle in Sierra Leone in 1792, where they founded Freetown and became known in Africa as the Nova Scotian Settlers. Nova Scotians fought in the Crimean War of 1853–1856. The Welsford-Parker Monument in Halifax is the second-oldest war monument in Canada (1860) and the only Crimean War monument in North America. It commemorates the Siege of Sevastopol (1854–1855). Nova Scotia is home to the largest Scottish Gaelic speaking community outside of Scotland, with a small number of native speakers in Pictou County, Antigonish County, and Cape Breton Island, and is taught in a number of secondary schools throughout the province. Nova Scotia's traditionally resource-based economy has diversified in recent decades. 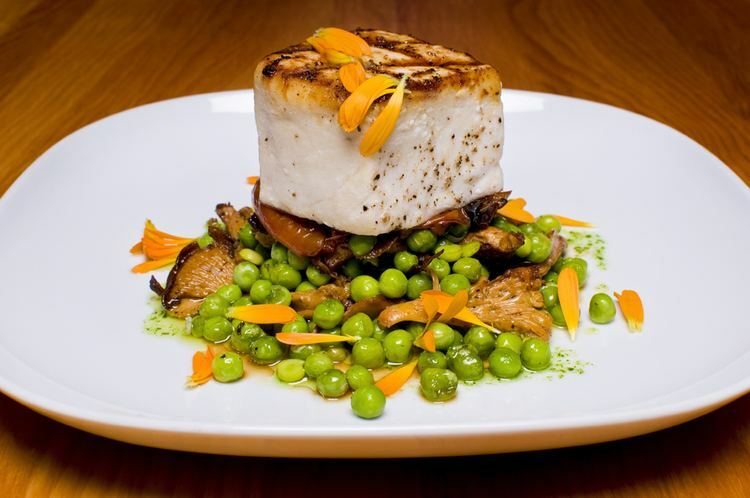 The rise of Nova Scotia as a viable jurisdiction in North America, historically, was driven by the ready availability of natural resources, especially the fish stocks off the Scotian Shelf. The fishery was a pillar of the economy since its development as part of New France in the 17th century; however, the fishery suffered a sharp decline due to overfishing in the late 20th century. The collapse of the cod stocks and the closure of this sector resulted in a loss of approximately 20,000 jobs in 1992. Other sectors in the province were also hit hard, particularly during the last two decades: coal mining in Cape Breton and northern mainland Nova Scotia has virtually ceased production, and a large steel mill in Sydney closed during the 1990s. More recently, the high value of the Canadian dollar relative to the US dollar has hurt the forestry industry, leading to the shut down of a long-running pulp and paper mill near Liverpool. Mining, especially of gypsum and salt and to a lesser extent silica, peat and barite, is also a significant sector. Since 1991, offshore oil and gas has become an increasingly important part of the economy, although production and revenue are now declining. Agriculture remains an important sector in the province, particularly in the Annapolis Valley. Nova Scotia’s defence and aerospace sector generates approximately $500 million in revenues and contributes about $1.5 billion to the provincial economy annually. The Nova Scotia tourism industry includes more than 6,500 direct businesses, supporting nearly 40,000 jobs. 200,000 cruise ship passengers from around the world flow through the Port of Halifax, Nova Scotia each year. This industry contributes approximately $1.3 billion annually to the economy. The province also boasts a rapidly developing Information & Communication Technology (ICT) sector which consists of over 500 companies, and employs roughly 15,000 people. In 2006, the manufacturing sector brought in over $2.6 billion in chained GDP, the largest output of any industrial sector in Nova Scotia. Michelin remains by far the largest single employer in this sector, operating three production plants in the province. Nova Scotia is ordered by a parliamentary government within the construct of constitutional monarchy; the monarchy in Nova Scotia is the foundation of the executive, legislative, and judicial branches. The sovereign is Queen Elizabeth II, who also serves as head of state of 15 other Commonwealth countries, each of Canada's nine other provinces, and the Canadian federal realm, and resides predominantly in the United Kingdom. As such, the Queen's representative, the Lieutenant Governor of Nova Scotia (presently Arthur Joseph LeBlanc ), carries out most of the royal duties in Nova Scotia. The direct participation of the royal and viceroyal figures in any of these areas of governance is limited, though; in practice, their use of the executive powers is directed by the Executive Council, a committee of ministers of the Crown responsible to the unicameral, elected House of Assembly and chosen and headed by the Premier of Nova Scotia (presently Stephen McNeil), the head of government. To ensure the stability of government, the lieutenant governor will usually appoint as premier the person who is the current leader of the political party that can obtain the confidence of a plurality in the House of Assembly. The leader of the party with the second-most seats usually becomes the Leader of Her Majesty's Loyal Opposition (presently Jamie Baillie) and is part of an adversarial parliamentary system intended to keep the government in check. Nova Scotian stories are the subject of numerous feature films: Margaret's Museum (starring Helena Bonham Carter); The Bay Boy (directed by Daniel Petrie and starring Kiefer Sutherland); New Waterford Girl; The Story of Adele H. (the story of unrequited love of Adele Hugo); and two films of Evangeline (one starring Miriam Cooper and another starring Dolores del Río). Nova Scotia has also been the subject of numerous literary books. Some of the international best-sellers are: Last Man Out: The Story of the Springhill Mining Disaster (by Melissa Fay Greene) ; Curse of the Narrows: The Halifax Explosion 1917 (by Laura MacDonald); "In the Village" (short story by Pulitzer Prize–winning author Elizabeth Bishop); and National Book Critics Circle Award winner Rough Crossings (by Simon Schama). Other authors who have written novels about Nova Scotian stories include: Linden MacIntyre (The Bishop's Man); Hugh MacLennan (Barometer Rising); Ernest Buckler (The Valley and the Mountain); Archibald MacMechan (Red Snow on Grand Pré), Henry Wadsworth Longfellow (long poem Evangeline); Lawrence Hill (The Book of Negroes) and John Mack Faragher (Great and Nobel Scheme). There are numerous songs written about Nova Scotia: The Ballad of Springhill (written by Peggy Seeger and performed by Irish folk singer Luke Kelly a member of The Dubliners, U2); numerous songs by Stan Rogers including Bluenose, The Jeannie C (mentions Little Dover, NS), Barrett's Privateers, Giant, and The Rawdon Hills; Farewell to Nova Scotia (traditional); Blue Nose (Stompin' Tom Connors); She’s Called Nova Scotia (by Rita MacNeil); Cape Breton (by David Myles); Acadian Driftwood (by Robbie Robertson); Acadie (by Daniel Lanois); and My Nova Scotia Home (by Hank Snow). Nova Scotia has also produced some significant songwriters such as Grammy Award winning Gordie Sampson. Sampson has written songs for Carrie Underwood ("Jesus, Take the Wheel", "Just a Dream", "Get Out of This Town"), Martina McBride ("If I Had Your Name", You're Not Leavin Me"), LeAnn Rimes ("Long Night", "Save Myself"), and George Canyon ("My Name"). Another successful Nova Scotia songwriter was Hank Snow whose songs have been recorded by The Rolling Stones, Elvis Presley, and Johnny Cash. Music producer Brian Ahern is a Nova Scotian. He got his start by being music director for CBC television's Singalong Jubilee. He later produced 12 albums for Anne Murray (“Snowbird,” Danny’s Song” and “You Won’t See Me”); 11 albums for Emmylou Harris (whom he married at his home in Halifax on January 9, 1977). He also produced discs for Johnny Cash, George Jones, Roy Orbison, Glen Campbell, Don Williams, Jesse Winchester and Linda Ronstadt. Another noted writer is Cape Bretoner Leon Dubinsky, who wrote the anthem, "Rise Again", among many other songs performed by various Canadian artists. 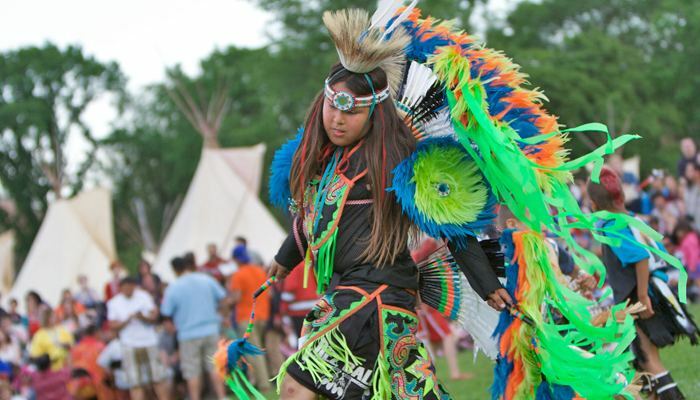 Nova Scotia has many museums reflecting its ethnic heritage, including the Glooscap Heritage Centre, Grand-Pré National Historic Site, Hector Heritage Quay and the Black Cultural Centre for Nova Scotia. Others museums tell the story of its working history, such as the Cape Breton Miners' Museum, and the Maritime Museum of the Atlantic. Nova Scotia has two national parks, Kejimkujik and Cape Breton Highlands, and many other protected areas. The Bay of Fundy has the highest tidal range in the world, and the iconic Peggys Cove is internationally recognized and receives 600,000 plus visitors a year.